The idea that feathers decorated and insulated the bodies of the small bird-like predatory dinosaurs of the Jurassic and Cretaceous – the coelurosaurs – is no longer a speculation limited to controversial artwork, but the mainstream view. Spectacular fossils from the Lower Cretaceous rocks of Liaoning Province in north-east China have shown that feathers, and simpler, filament-like ‘proto-feathers’, were widespread among coelurosaurs, being present in compsognathids and basal tyrannosaurs as well as in the maniraptorans (the oviraptorosaurs, troodontids, dromaeosaurs and kin). 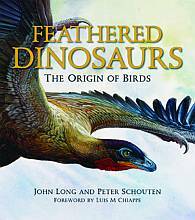 In this new book, author John Long and artist Peter Schouten have worked together to show-case a diversity of coelurosaurs (many of which are only recently discovered) in modern, state-of-the-art life restorations. Schouten is well known for the several volumes he has illustrated for author Tim Flannery, most recently A Gap in Nature (William Hieneman, 2001) and Astonishing Animals: Extraordinary Creatures and the Fantastic Worlds They Inhabit (Atlantic Monthly Press, 2004). Like A Gap in Nature and Astonishing Animals, Schouten’s artwork is the main focus of Feathered Dinosaurs (rather than Long’s text), so it would be wrong for a reviewer to comment on the text and to merely state in passing that there were lots of pretty pictures. I love Schouten’s art and think that his renditions are novel, insightful, exciting and often just beautiful. The giant compsognathid Sinocalliopteryx is depicting attacking a dromaeosaur (an interaction inspired by the fact that the Sinocalliopteryx type specimen has a dromaeosaur leg preserved in its stomach) and Saurornitholestes pulls flesh from the immense carcass of a fallen Quetzalcoatlus, the sheer size of the pterosaur being wonderfully conveyed by the fact that, even on this double-page spread, all we get to see of it is its eye and the back of its head. An adult Epidendrosaurus feeds its young and the alvarezsaurid Shuvuuia – shown as having a head resembling that of a pangolin – licks termites from an opened gallery in rotten wood. Buitreraptor gapes wide in a silent scream, and both Ornitholestes and Huaxiagnathus (referred to throughout the book as Huaxignathus [sic]) are shown clambering around in trees (homages to Paul’s 1988 Predatory Dinosaurs of the World?). Schouten’s attention to detail is so good that we see the ticks nestled in the folds of skin around the eye of Alioramus. Scavenging insects are visiting the eyes and decomposing flesh of that dead Quetzalcoatlus, tyrannosaurs have eyelashes and fine hairs in their ear and nasal orifices, and frayed feather-tips betray the fact that maniraptoran hand feathers must have been subject to a reasonable amount of erosion. These animals are vibrantly alive, and they fit into their environments in the way that real animals should. Schouten’s theropods are undeniably avian in appearance, and among the most avian of non-avian theropods depicted so far. But I actually think that the birdiness often goes too far, especially when the modern-day inspiration that Schouten drew from is all too obvious. The bad news is that Schouten’s lack of experience with non-avian dinosaurs sometimes shows. The most obvious problem with his dinosaurs is that many of them are far too chunky, with stout hindlimbs and bodies way broader than they should be. Some details are also portrayed incorrectly. But these are trivial gripes. This book is a joy to look at and will be enjoyed by anyone interested in dinosaurs.